Early research in ocean waters indicated similarities in the behaviour of trace metals and nutrients vis-à-vis exposed organisms suggesting that it is not only so that essential trace elements may affect phytoplankton, but that phytoplankton in turn may regulate trace metal composition in the surrounding water for its own benefit (Hunter et al. 1997). These insights have been mainly possible by the development of analytical (in particular electrochemical) techniques that were able to measure free metal ions and metals complexed by naturally occuring ligands of biotic origin in ocean waters at the sub-nmol/l levels (see chapter 6). From these speciation studies it became soon clear that the so-called free metal ion activitiy of many essential and toxic metals (which means their bioavailability) is controlled by highly specific, strong complexing ligands exuded by the marine phytoplankton. This rather new research line inspired soon the formulation of a new paradigma, according to which both growth rates and species composition of primary marine organisms are affected by trace metal levels now orders of magnitude lower than conventionally believed. One consequence of this statement was the insight that the natural capacity of natural waters to assimilate metallic contaminants may be actually affected at concentrations much lower than was thought reasonable. When determining the species distribution and composition of metals in a hardwater eutrophic lake, Odzak et al. (2002) found that DGT-labile Cu and Ni species (DGT = 'Diffusive Gradients in Thin Films'; see more details in section 5.5.3) were mainly organically complexed (as determined by 'Ligand-Exchange' / 'Differential Pulse Cathodic Stripping Voltametry' (DPCSV)) and constitute up to about 15-25 % of the total dissolved metal concentration. Of the total dissolved Zn about 30- > 90 % was found in a DGT-labile form (of total Mn about 50-100 %), of which less was probably organically bound/complexed. A larger fraction of the DGT-labile Zn occurred in the hypolimnion of the lake, probably due to strong ligands available in the productive surface water. The authors conclude that the combination of measurements of dissolved and DGT-labile species may better allow us today to elucidate those mechanisms controlling the cycling and bioavailability of metals in a lake. To assess the aqueous speciation and bioavailability of Zn in runoff water, Karlen et al. (2001) used in combination with a water-ligand model ('MINTEQA2') and a humic aquatic model ('WHAM'), a standard growth inhibition test (algae Raphidocelis subcapitata), and a Zn-specific biosensor with the bacterial strain Alcaligenes eutrophus. Their models and test results showed that a majority of the released Zn occurs as free hydrated, bioavailable Zn2+ ion. We know that many trace metals form also complexes with dissolved refractory (less degradable) organic substances (ROS), why metal mobility in aquatic systems strongly depends on the kinetic and thermodynamic stability of these compounds. High values of complexed metals are usually found for Cu but not for Zn, while Cr3+ forms kinetically stable ROS complexes. Empirical studies also show that there is no positive correlation between DOC and the complexed metal fraction in natural (and waste) waters indicating that it is not the DOC of the ROS per se, but different functional groups present on these organic substances, which are important for metal complex formation (ref. in Heumann et al., 2002). In a recent survey, Heumann et al. 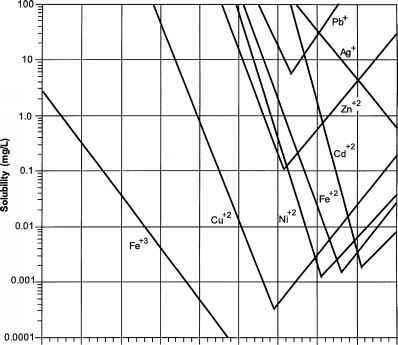 (2002) observed different complexed fractions for total copper and zinc indicating differences in the complexing capacity of ROS for different metals. As an example, Cu was almost totally complexed by ROS in wastewater, but only up to 39% in natural brown water samples. Correlating structural data obtained by 13C NMR (Nuclear Magnetic Resonance) measurements for ROS with the corresponding complex formation helped to elucidate the reason for these differences. By evaluating the NMR spectroscopic data, Heumann and coworkers succeeded to relate a decrease of the C-O binding fraction in ROS's to a decrease of Cu complexes, whereas the aliphatic binding character increased with decreasing Cu complexation. It is well known that the thermodynamic and kinetic stability of metal-ROS complexes is an important property in controlling the distribution, mobility and bioavailability of metals in aquatic systems (see Fernando 1995, and references given in Heumann et al. 2002, for methods to determine stability constants of metal-ROS complexes). According to our present state-of-knowledge, if a complex can be judged kinetically labile or stable depends on the speed of exchange of a ligand between the dissolved "free" metal ions and those in a complex. Taube (1952) (ref. given in Heumann et al., 2002) defined a complex kinetically stable if the reaction time for exchange of ligands is more than 1 min. Time scales of the ligand exchange rate for kinetically stable metal-ROS complexes are supposed to be hours and days rather than minutes. The authors further point out that transition metals, including Cu, Zn, and Ni with a d3 (high spin) or d6 (low spin) electron configuration are known to form kinetically stable complexes even under thermodynamically unstable conditions. By means of experiments with isotopically enriched spikes of metal ions (here of Cu2+ and Cr3+), it is possible to determine kinetically stable metal-ROS complexes. The basic theory of the isotope dilution technique in short: an excess amount of a metal ion in its natural isotopic composition is added to a ROS-containing water sample to completely saturate all ligand binding sites. After equilibration, the metal-ROS complexes are separated by size-exclusion chromatography (SEC). An identical isotope distribution in all fractions enables the identification of kinetically labile metal-ROS complexes, because exchange equilibration occurred between the isotopically non-enriched metal ions first bound by ROS, and the isotopically labelled free ions of a spike. In contrast, isotopic compositions similar with or identical with the natural isotopic abundances, indicate kinetically stable complexes. This means that the rate of free metal ions exchange can be used as a measure of complex stability. The isotope-dilution experiments by Heumann et al. (2002) showed that different Cr(III)-ROS fractions can be either kinetically labile or stable, probably due to different structural elements and or functional groups in the corresponding ROS fractions. This was in contrast to results obtained for Cu, where total exchange equilibration with free 65Cu ion was observed for all Cu(II)-ROS complexes of different molecular size, indicating kinetically labile complexes at least within the given test period (of 2 days). Mobility and transport of trace metal ions in natural waters are strongly regulated by the complexation with humic substances (HS), and by corresponding ionic, hydrophobic and electron donor-acceptor interactions. But so far, only the thermodynamic stability, expressed by complex stability constants, is almost exclusively used and supposed to be decisive for the distribution of metals in HS systems. However, and as mentioned before, kinetically stable metal/HS complexes can form even under thermodynamically unstable conditions. Marx and Heumann (1999) earlier performed isotope-dilution experiments to investigate the kinetic stability of Cr(III) complexes with humic substances (HS). In short, HS solutions of different origin have been spiked with 53Cr(III) and 65Cu(II) after saturation of HS with Cr and Cu of natural isotopic composition and finally the formed complexes separated and assessed by ultrafiltration, High-PerformanceLiquid Chromatography and Inductively Coupled Plasma-Mass Spectroscopy (HPLC/ICP-MS), and SEC. Distinct differences observed in the isotopic composition of Cr in the permeate of the ultrafiltration, when compared with the unseparated solution, suggested the occurrence of kinetically stable Cr(III)/HS complexes. The observed kinetic stability can be explained by the d3 electron configuration of Cr3+. This was in contrast to the Cu isotopic composition, which was identical in the permeate and the unseparated solution, confirming that a total exchange of Cu2+ ions took place between the free Cu2+ and HS- complexed Cu ions, hence indicating the formation of labile Cu/HS complexes (at least within the experimental time of 1h). The observed differences in the isotope ratios found in the permeate and unseparated sample also indicate a different distribution of molecular sizes and a great variation of functional complexing groups existing in different HS fractions. The experimental results presented by Marx and Heumann (1999) have been the first definitive evidence for the existence of kinetically stable Cr/HS complexes. The experiments further proved the long-term stability of these complexes, which also means that these metal forms show a strong mobility in environmental systems after having been formed. SEC results also indicate that high molecular Cr(III)/HS complexes seem kinetically more stable than low molecular complexes. As most surface waters are oxygenated, the role of sulphides for aqueous metal speciation has still received only little attention. Their persistence in oxic waters may be partly due to the formation of relatively stable metal sulphide complexes with large binding constants, but may also indicate their origin from sulphides from sources like sewage works, dams or wetlands. Sulphides have been observed at nano- and picomolar levels even in oceanic waters. 3000 MW cutoff) to evaluate the size fractionation of these complexes. In natural river water very low free Cu2+ levels of 10"10-10"14 M have been found probably due to the occurrence of dissolved organic (humic) matter. Voltametric sulphide peak measurements in river waters (pH = 6.8) after a 10 min purge were assumed to be from Co, Fe, Mn and Ni (bi)sulphides. Lowering pH down to pH < 5.2, the observed increasing sulphide peak was supposed to originate from dissociating Zn and Pb sulphide complexes and soluble FeS, while down to pH values ~ 2.8, the observed sulphide peak is thought to be solely composed of S2- mainly derived from the dissociation of CuS. Indeed measuring river water samples revealed no free sulphides indicating that formation of metal sulphide complexes was responsible for the observed sulphide persistence in oxic water. The majority of sulphides occurred as Cu and Zn complexes probably due to their strong binding constants preventing them from oxidation and dissociation in these slightly acidic waters. Although dissolved metal sulphide complex stabilities are assumed to follow the order: Fe > Mn > Zn (> S2-) > Cu, Cu was more bound to sulphide than Zn. Overall Cu sulphides accounted for about 30 % of the dissolved metal portion, whereas Zn sulphides remained <10 %, probably due to the greater amount of Zn present in the river water. Size fractionation uncovered the influence of the sources of the metal sulphide complexes. The authors speculate about the presence of > 3000 MW size metal sulphide complexes, and explain their occurrence by an organic growth of so-called 'metal sulphide clusters' on the sulphide surface. It is supposed that various organic groups, like phenyl ligands, may bind to these surfaces and hence increase sulphide stability, e. g. against dissociation at lower pH levels. In order to study the oxidation kinetics of these metal sulphides, their losses were studied in closed reaction vessels over a period of 10 days. Regression analysis indicate that first-order kinetics prevail. Table 5.4 shows the rate constants calculated for the identified metal sulphide complexes and corresponding half-lives demonstrating greatest resistance for Cu and Zn sulphides. In summary, the experiments by Razon et al. (1999) confirm that metal sulphide complexes persist in oxic surface waters, which could be relevant for the speciation of Zn and Cu in small and medium-size rivers with residence times of a few weeks.